With the growing range of utilities and consequently the growing necessity and dependence over them, our homes are full of possessions. Having these facilities is one thing, and managing all the stuff in your house is another. Having a toddler at home automatically doubles the commodities as well as the fuss. Childcraft Abbott Dressing Table is purposed to serve the need of properly organizing your utilities while covering the minimum space in your room. With its storage shelves and minimalistic design, it is a preferable choice for both its function and appearance. It is a wooden table which comes in easily adjustable pieces that require assembly. 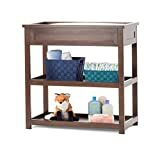 Many different alternatives to this changing table can be found in our changing table buying guide, or you can just compare this table to a more bulky one with drawers, like this Catimini changing table from South Shore. The two sturdy and well-balanced shelves can easily hold different objects of childcare. Two separate shelves can be used to hold multiple items, which is handy for daily routine. These shelves also contain dressing pads and straps with tightly secured buckles for the safety of the child while changing. The Childcraft Abbott Dressing Table comes in different wooden pieces which are easily adjustable and assembled. Shipping in the form of parts saves it from damages and freight misadventures. It also makes it extra convenient if one has to move it to a different room or carry it while traveling. However, this gives it a limitation of losing pieces which may make the product useless. The minimalistic space requirement makes it the right choice for storing purposes without consuming a lot of area in the room. However, assembling the parts serves as a trouble for some customers who may find it hard to follow the instruction guide. The Childcraft Abbott Dressing Table has been greatly liked by its customers who were mostly satisfied with its diverse usability and convenience. While most customers could easily put up the table from the given pieces, some found the assembly a baffling practice. For this purpose, the product is delivered with a handbook guide for the assembly process, making it an easy job. Hence, this product is all about convenience and easy usability.